Want fireworks but don’t have the space? Our new range of custom-made zero-fallout fireworks are perfect for city centre rooftops. They can be used for Christmas Lights switch-ons or to celebrate an event in the town centre where conventional fireworks can’t be used. 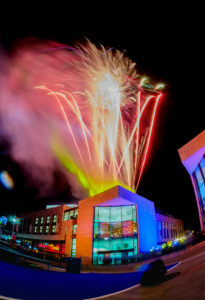 When VW opened their new HQ in Milton Keynes they commissioned this amazing rooftop display staged by our associate company Fantastic Fireworks. We fire rooftop displays for many Christmas Lights events including Poole, Letchworth, Exmouth, Gosport, Pontypridd and Aylesbury. Watch this amazing sequence from the VW opening with laser beams, lights and flames.